Process NMR Associates, LLC (Danbury CT) and Active Spectrum, Inc (San Carlos CA) are collaborating in the application of micro-ESR technology to petroleum applications. The initial work has focussed on crude oils but will soon be expanded to residues and cracker feedstocks. The central peak is a combination of a persistent carbon-centered organic radical (g = 2.003) found in asphaltenes, and a vanadyl (VO2+) peak. The additional smaller peaks are associated with vanadyl only. For producers, the technique could be used to rapidly measure asphaltene concentration on-line. The spin density of the organic radical is a function of the maturity of the oil and will of course vary between deposits. 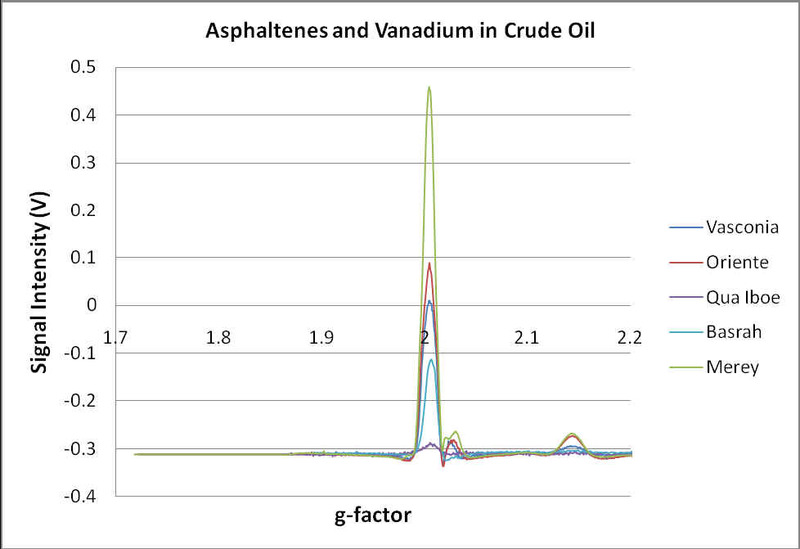 Notwithstanding, rapid electronic measurement of asphaltenes remains a topic of great interest. Similar techniques have also been used to assess the quality of coals. For refiners, vanadium is a contaminant that poisons the refinery catalyst. ESR has been used by refiners since 1962 to rapidly measure vanadium content in crude oil feedstocks both on-line and in laboratories. Active Spectrum Inc.